Nole made an unexpected exit from the singles at Queens this week at the hands of Xavier Malisse, which I can’t shed any light on as I didn’t have court 1 tickets (I was watching Marin play doubles by himself, I mean with the incredibly useful Andre Sa as a partner, so all I saw of Nole’s match was the occasional spiky kitten-head bobbing up over the fence and, once, a racquet soaring into the air). Still, he doesn’t leave empty-handed, after teaming up with Israel’s Jonathan Erlich to take the doubles title, 67(6) 62 10-3 over Beck and Skoch. I’d have rather seem him smooching a bigger trophy (and without assistance), but these days I will take any happy Nole I can get, sad to say. Big, jug-eared trophy, big, jug-eared man. 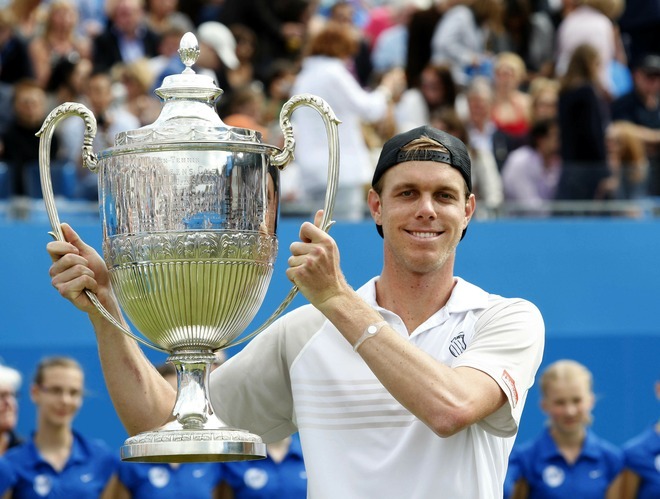 Sam Querrey came out on top in the Final No-one Saw Coming, capitalising on being the only seed left in the draw after everyone’s picks for the title crashed out earlier in the competition: Rafa Nadal lost to the excellent Feliciano Lopez, Novak Djokovic to Xavier Malisse, Andy Murray to Mardy Fish, Andy Roddick to pocket rocket Dudi Sela, and Marin Cilic to Michael Llodra. 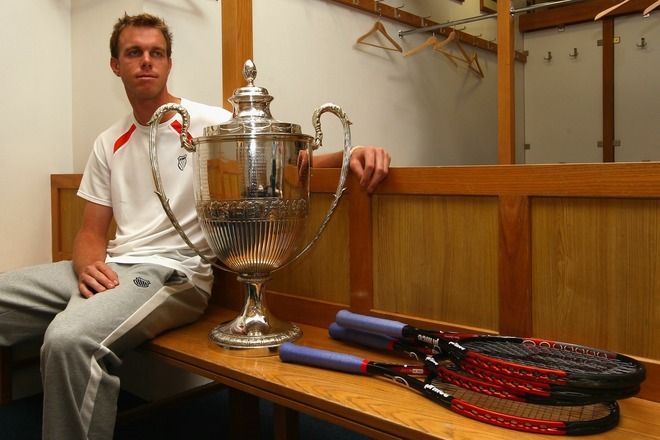 It was that sort of week, so credit to Querrey and Fish for making it to the final. Fish looked the better player all week and indeed served for the second set, but seemed to be overpowered by his own desire and rather collapsed at the end of the match, leaving the field clear for Sam’s well-executed baseline game. Both boys were suitably charming in the post-match analysis, with Sam earning bonus points for meretriciously picking England to win the World Cup and thereby deserving the traditional somewhat awkward Queens locker-room trophy photo shoot. Strike a pose, it turns out there is something to it. That’s Sam’s third title for the year (only Rafa has more) and he’s picked up one indoors, on clay and grass. Not a bad year for the emo one. Not bad at all. Incidentally, if anyone’s still interested in my Queens experiences earlier in the week, I’ll try to write something. Actually, I probably will even if nobody is. So there. The good news? Kolya and Steps are back. The bad news? Boss and Baggy are already out. Somehow. The good news? I’m going to be there Wednesday and Thursday, and @rachaelsimpson is already there tweeting in classic style. The bad news? Rain. Lots of rain. Let’s get on to the fun stuff. The good stuff. The green stuff. QUEENS. Defending champion Mandy had a haircut. Looking businesslike. I approve. 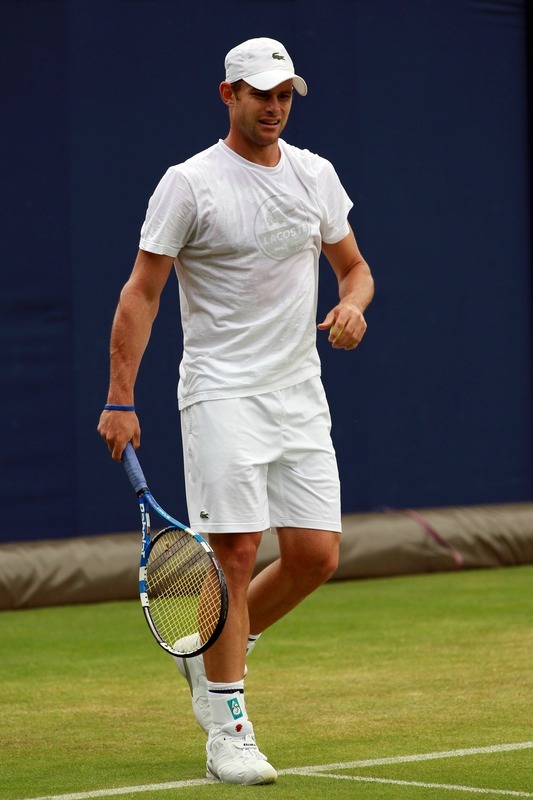 I am genuinely looking forward to watching Roddick on grass. What a difference a year makes. Rafa practiced in the rain, just to be *deliberately* cute about it. And Momo was there for no reason. Just there. Hanging around. Being perfect. This is the magic of Queens. Three Lions On The … No, Wait. 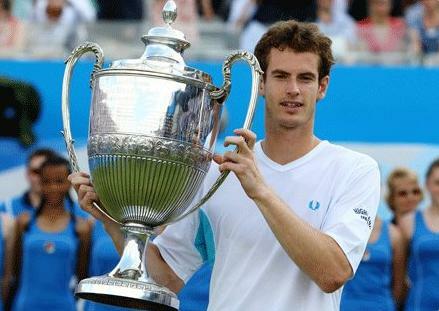 Defending champion Andy Murray announced formally that he’s coming back to the AEGON Championships at Queens this June. This is a not merely a thing, it is a Good Thing. The subject turned to football, and the World Cup and England. Murray, mindful of being trapped the last time he was asked about their prospects, answered in a manner that suggested the Scot may have a future in politics. “When England play in the World Cup and concede a goal, I’m not jumping up in front of the TV because I’m happy they are losing,” he said. “If one of my English friends is watching and England score, he’ll be on his feet yelling and screaming and, though I’m happy, it’s not the same sort of passion. “If England lost, my friends will be deflated and disappointed and I will be, too. But I’m not cheering whoever England’s opponents are. That’s absolute ****.” Subject closed. The Queens field also includes Nadal, Djokovic, Roddick, Verdasco, Tsonga and Cilic. And, in a spectating capacity, me. I’ve got my tickets for two whole days (bloody World Cup) and I am frankly unbelievably excited about it. Anybody else out there planning to attend? I’ll be the girl drinking beer and watching Michael Llodra lying on the ground. For an hour. I realise I may have missed the boat on blogging several pieces of salient Elfnews. But I had to call some of them to your attention. At least not when he has an abdominal strain. Nadal has withdrawn from next week’s Thailand Open, citing the need to recover from the muscle tear he has been carrying since Cincinnati which hampered him in the US Open and prevented him from competing in Davis Cup. Serious question to Chris Kermode of Queens and a few other choice tournament directors: have you ever considered the wisdom of the Spice Girls? Because, you know, too much of something is bad enough, but something should be coming over you to make you wonder if too much of nothing is just as tough. In other words: pay for Novak Djokovic next time. Murray and Haas celebrate with the women in their life. 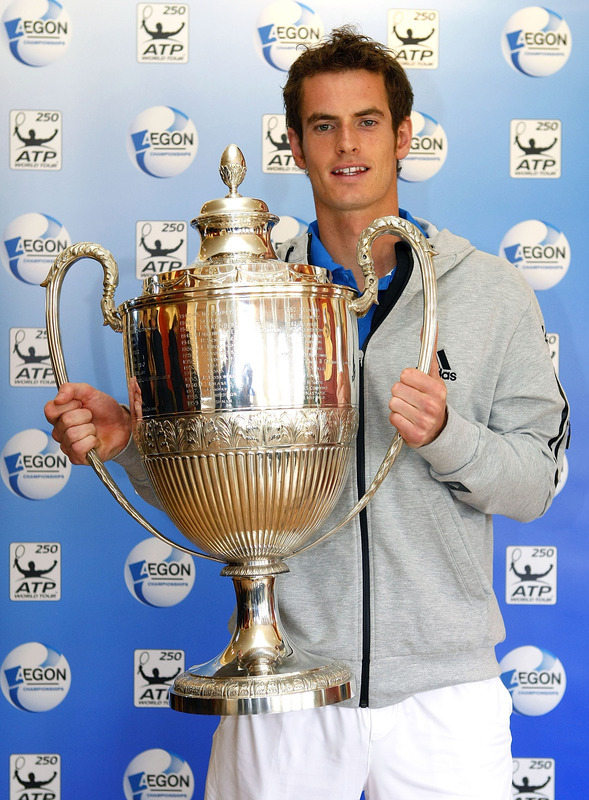 Andy Murray today became the first British man to win Queens since 1938 when he defeated James Blake 75 64. And it only took 71 years. Who says British tennis is crap? The party line from the Murray camp seems to be that Andy is totally unaffected by all the pre-Wimbledon hype and pressure. I’m not convinced. He looked a bit more stressed than usual during this tournament – all the string-punching and consequent knuckle-bleeding – and a bit nervous today, especially at the beginning when he dropped serve immediately after breaking Blake. Still, his first grass-court title. I’m delighted. Although even as a Murray fan, the media over the next week is going to be unbearable. 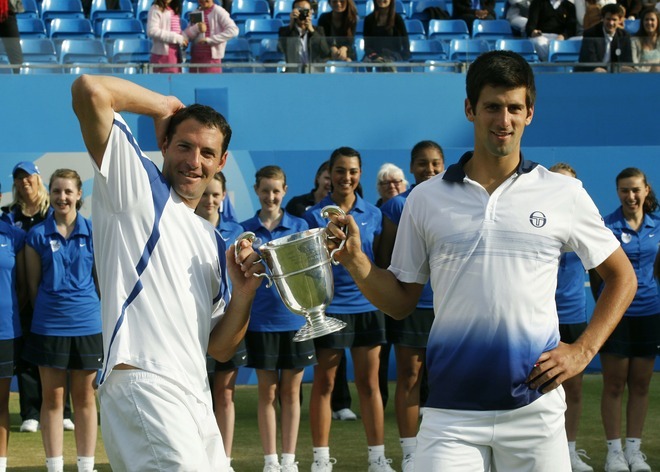 Good result for Blake though – his second final of the year after Estoril? And he was pure class throughout. Good show. We give the foreigners the tiny trophies. Andy Murray will face James Blake in the finals of the AEGON whatever. Murray is the first British man into the finals since 1938. So, you know, no pressure. 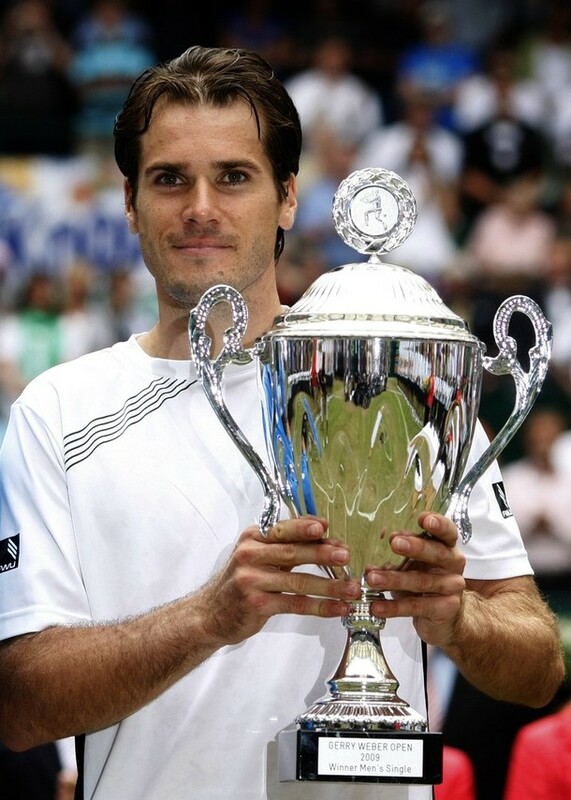 He defeated Juan Carlos Ferrero 62 64. The first set was pretty much an exo, but the second set was much tighter and this is Ferrero’s best result on grass since … ever, maybe? Mark Petchey recounted a conversation he’d had where the Spaniard said that he believes he can get back into the top 15, and that he thinks he’s playing better than he did when he was world no. 1 – but the game has moved on in the meantime. Still got amazing thighs though. After that quick match, it was time for Blake-Roddick, but sadly it was a bit of a damp squib as Roddick turned his ankle on the lip of the grass at the back of the court and was forced to retire. I don’t think it should have any impact on Roddick’s Wimbledon, and Blake was playing some great tennis including a sublime open-stance backhand up the line, so it should be a fun final.